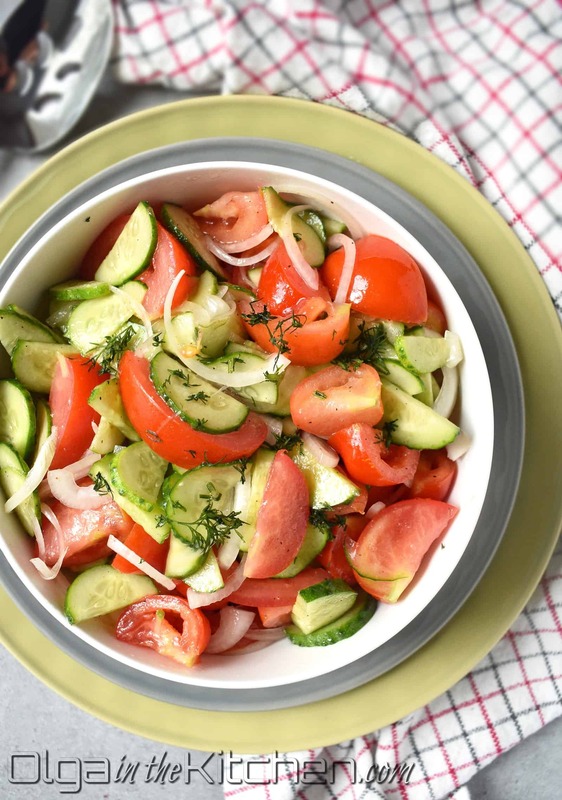 Tomato and Cucumber Salad: the easiest and the simplest 3-veggie salad that will wow the crowd. 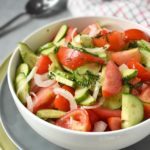 This salad is usually made during summer months when you have lots of fresh tomatoes and cucumbers at home. 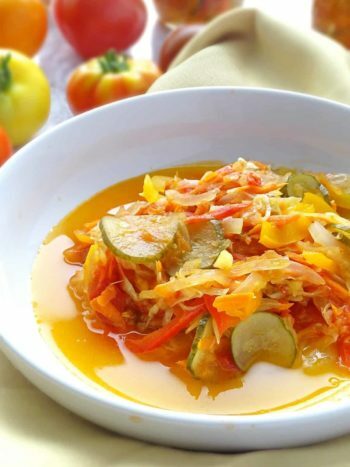 This salad is most likely a staple at many or most Ukrainian homes. It requires no special preparation, all you need is 10-15 mins for the whole process. You know how sometimes you have those times when someone knocks on your door and you’re starting to panic what to feed them? Well, I always have onions on my hand, sweet and regular and with our garden veggies, I never have to worry in summer time. 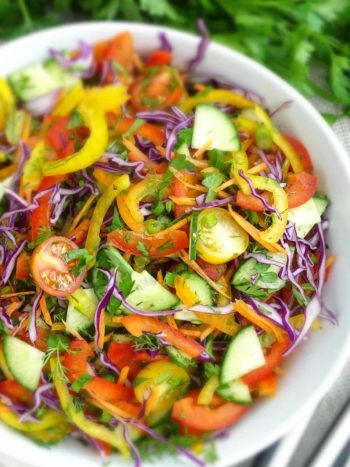 This salad always comes to rescue! For past 3 summers, my husband and I had been growing some vegetables in our garden. 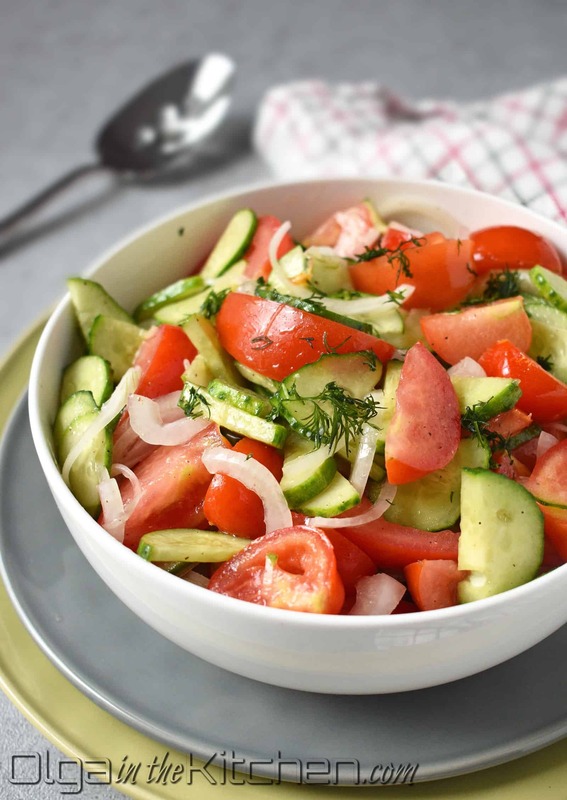 Tomatoes and cucumbers are a must. My husband is more of a tomatoes eater and I’m more of a cucumber eater. This whole summer all of our salads consisted of tomatoes and cucumbers in some way. These two vegetables are nothing like the ones you buy and taste from store. Garden tomatoes and cucumbers are so full of flavor and the salads are incredibly delicious. They are not watery and they don’t lack flavor. If you’re using store-bought, you will most likely need more salt and pepper than the recipe calls for. If you ever get a chance to experiment with home garden, even a few bushes, you won’t be disappointed. Just remember to water. Cucumbers love water and tomatoes just need water; they don’t need a lot otherwise they will grow watery. 1. Wash, paper towel pat dry tomatoes and cucumbers. Cut 1 lb tomatoes into about 1” pieces. Place them into a large bowl. 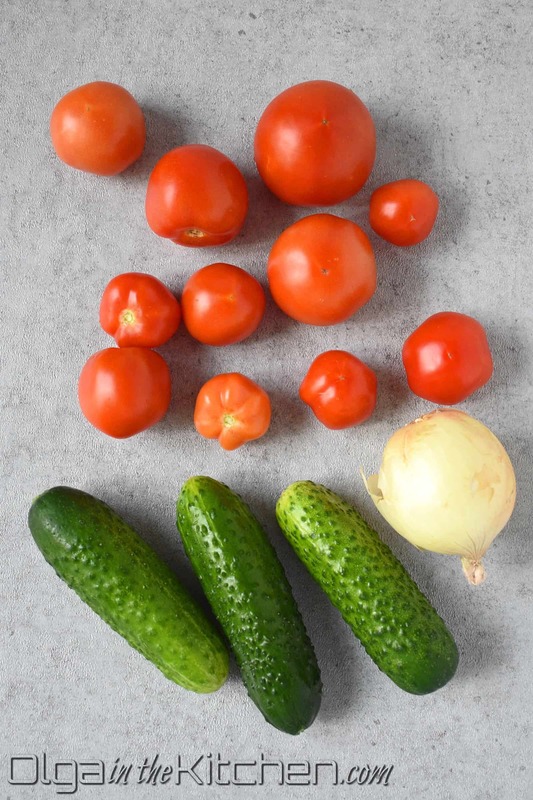 Cut 3 small cucumbers into half and slice about 1-2” thick and add to the bowl with tomatoes. Cut 1 small yellow onion in half and thinly slice. Add to the bowl with salad. 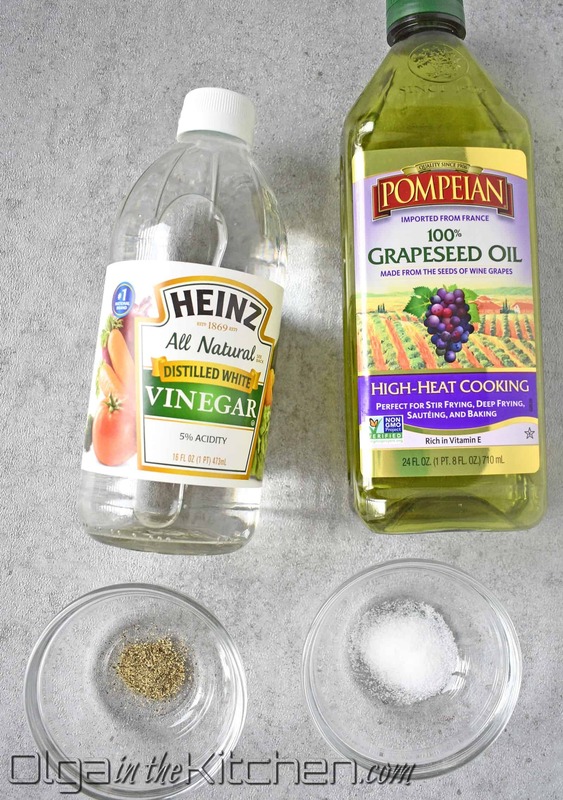 TO MAKE THE DRESSING: In a small bowl, combine and mix well: 3 tbsps grapeseed oil, 1 tbsp distilled white vinegar, 1/2 tsp table salt and 1/8 tsp ground black pepper. 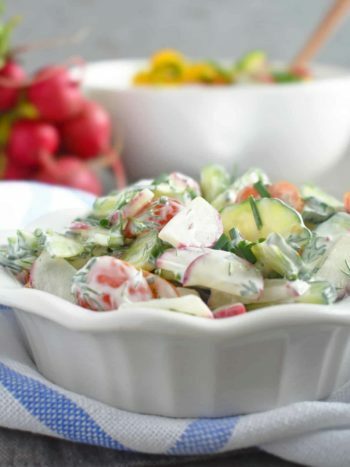 Drizzle the dressing over the salad just before serving and stir well with a spoon. Add more salt and pepper to taste if desired. Serve the salad with mashed potatoes or potato wedges, meatballs or any piece of meat. Enjoy!! 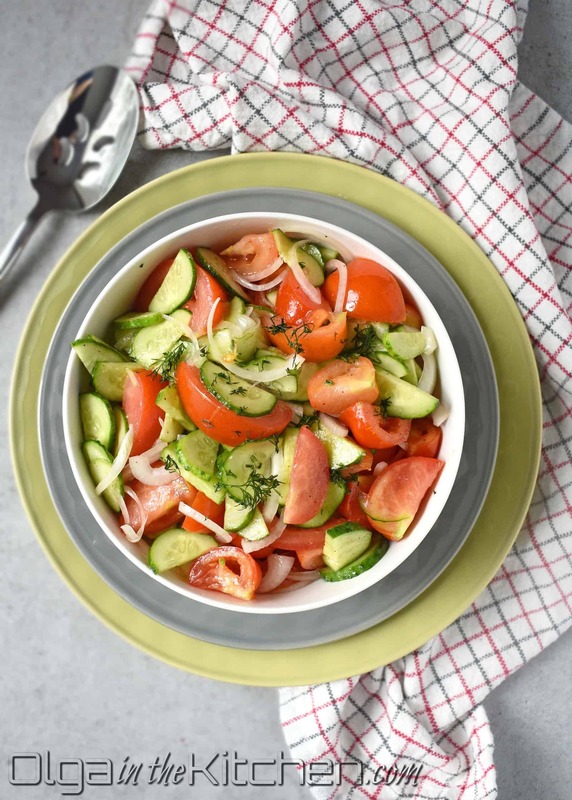 Tomato and Cucumber Salad: the easiest and the simplest 3-veggie plus a dressing salad that will wow the crowd. 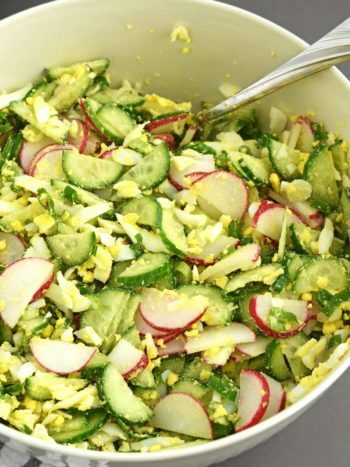 This salad is a lifesaver for any last minute or unexpected guests. Wash, paper towel pat dry tomatoes and cucumbers. Cut 1 lb tomatoes into about 1” pieces. Place them into a large bowl. 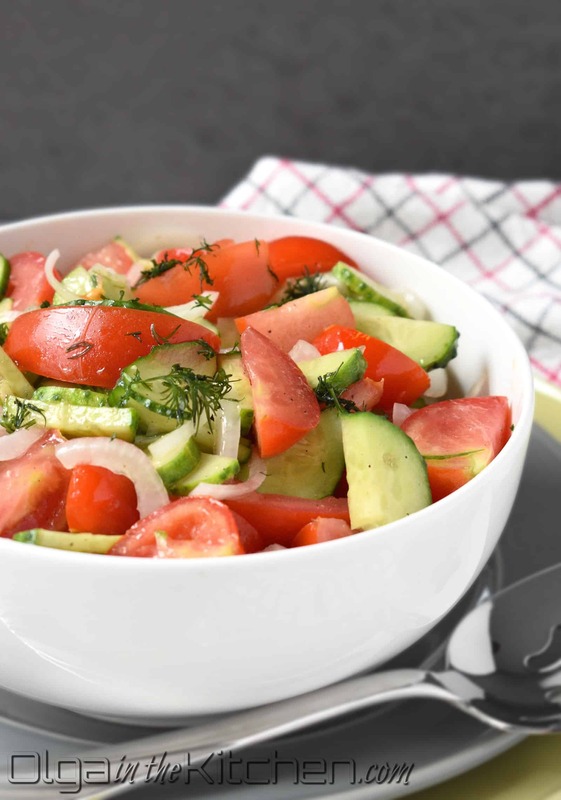 Cut 3 small cucumbers into half and slice about 1-2” thick and add to the bowl with tomatoes. Cut 1 small yellow onion in half and thinly slice. Add to the bowl with salad. In a small bowl, combine and mix well: 3 tbsps grapeseed oil, 1 tbsp distilled white vinegar, 1/2 tsp table salt and 1/8 tsp ground black pepper. Drizzle the dressing over the salad just before serving and stir well with a spoon. Add more salt and pepper to taste if desired. Serve the salad with mashed potatoes or potato wedges, meatballs or any piece of meat. Enjoy!! This is my favorite salad! Easy and delicious! We are thinking to try gardening vegetables next year, never did yet and I’m so excited! Having fresh veggies anytime during the summer is the best. It’s like always having salad at home!? you won’t regret! This is the easiest and the quickest salad I’ve ever had. Few ingredients, but so much flavor. Thanks Josh, I totally agree!